Alzheimer’s disease (AD) is a progressive neurodegenerative disease characterized by amyloid plaques, composed of amyloid-beta peptide (Aβ) and neurofibrillary tangles, composed of aberrantly phosphorylated tau. APOE4 is the greatest genetic risk factor for AD, increasing risk up to 12- fold with a double allele compared to APOE3. In contrast, APOE2 reduces AD risk ~2-fold per allele. Accumulating evidence demonstrates that apolipoprotein E4 (apoE4) plays a multifactorial role in AD pathogenesis, although the exact mechanisms remain unclear. Further data support roles for apoE4 as a toxic gain of function or loss of positive function in AD, a discrepancy that has significant implications for the future of apoE-directed therapeutics. However, recent evidence repurposing retinoid X receptor (RXR) agonists, or rexinoids, for the treatment of AD demonstrates conflicting, though potentially beneficial effects in familial AD-transgenic (FAD-Tg) mouse models. Of particular note is bexarotene (Targretin®), a selective rexinoid previously utilized in cancer treatment emerging as a viable candidate for AD clinical trials. However, the mechanism of action of bexarotene and similar rexinoids remains controversial, particularly in the context of human APOE. In addition, rexinoids demonstrate distinct adverse event profiles in humans that may have greater detrimental effects in an elderly AD population. Therefore, this special issue review discusses the implications for rexinoiddirected therapeutic strategies in AD, the potential mechanistic targets, and future directions for the improvement of rexinoid-based therapies in AD. 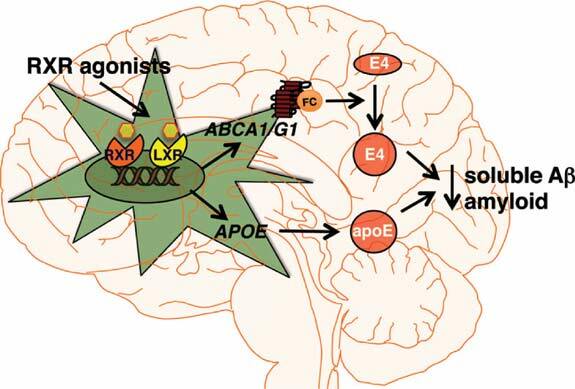 Keywords: ABCA1, Alzheimer's disease, Aβ peptide, Amyloid, Apolipoprotein E, Bexarotene, Rexinoids, Therapeutic. Keywords:ABCA1, Alzheimer's disease, Aβ peptide, Amyloid, Apolipoprotein E, Bexarotene, Rexinoids, Therapeutic. Abstract:Alzheimer’s disease (AD) is a progressive neurodegenerative disease characterized by amyloid plaques, composed of amyloid-beta peptide (Aβ) and neurofibrillary tangles, composed of aberrantly phosphorylated tau. APOE4 is the greatest genetic risk factor for AD, increasing risk up to 12- fold with a double allele compared to APOE3. In contrast, APOE2 reduces AD risk ~2-fold per allele. Accumulating evidence demonstrates that apolipoprotein E4 (apoE4) plays a multifactorial role in AD pathogenesis, although the exact mechanisms remain unclear. Further data support roles for apoE4 as a toxic gain of function or loss of positive function in AD, a discrepancy that has significant implications for the future of apoE-directed therapeutics. However, recent evidence repurposing retinoid X receptor (RXR) agonists, or rexinoids, for the treatment of AD demonstrates conflicting, though potentially beneficial effects in familial AD-transgenic (FAD-Tg) mouse models. Of particular note is bexarotene (Targretin®), a selective rexinoid previously utilized in cancer treatment emerging as a viable candidate for AD clinical trials. However, the mechanism of action of bexarotene and similar rexinoids remains controversial, particularly in the context of human APOE. In addition, rexinoids demonstrate distinct adverse event profiles in humans that may have greater detrimental effects in an elderly AD population. Therefore, this special issue review discusses the implications for rexinoiddirected therapeutic strategies in AD, the potential mechanistic targets, and future directions for the improvement of rexinoid-based therapies in AD.